I’ve looked at a fair number of Turtle Beach headsets over the years, but I’ve never seen the words “PC Gaming” emblazoned across the packaging. Sure, you could still use Turtle Beach’s headsets with your PC—most via a simple 3.5mm jack, and even the recent Turtle Beach Stealth 700 could connect to your PC via the Xbox Wireless Adapter. The Turtle Beach Elite Atlas ($99.95 on Amazon) makes it official, though. This is a PC-first headset, even if that’s mostly a marketing bulletpoint. Let’s dig in. First I want to talk design, because that’s where Turtle Beach has seriously impressed me with the Elite Atlas. I’ve long derided Turtle Beach for its chintzy-feeling headsets. Even the more expensive models were built from budget materials (lots of plastics) and seemed one good twist away from snapping in half. With the Stealth 700, the best I could say was that it looked premium from afar, but getting up close broke the illusion. The Elite Atlas, true to its name, is an actual premium headset—especially by Turtle Beach standards. There’s still a fair amount of plastic on the earcups, but it’s a slick piano-black gloss with minimal branding. And the headband! The Elite Atlas has a proper floating headband, with two thick rotating joints connected to the earcups and a durable piece of metal as support. Is it the fanciest headset I’ve used? Of course not. But it’s a marked improvement for Turtle Beach, which has struggled to match the upsurge in headset quality these past few years. It’s also up there with the most comfortable headsets I’ve used. A lot of floating headband designs struggle to find the right balance between a firm grip and a vice grip on your head—or worst of all, the dreaded “too loose” feeling. But not the Elite Atlas. I’m not going to go so far as to say I forgot I was wearing it, but I did use it for hours at a time with no issue. There aren’t many headsets I’d rather wear for an all-day gaming session, at least as far as comfort’s concerned. And the earcups are a significant part of that comfort as well. In the past I’ve been a fan of leatherette earcups, in part because I always find mesh or “athletic” padding scratchy and coarse. Worst of all are the headsets with mesh that pulls on my beard hairs. The Elite Atlas uses some sort of microfiber cloth though, similar to the fabric Razer’s using these days (e.g. on the Nari Ultimate). It’s really soft, while still being more breathable than leatherette. 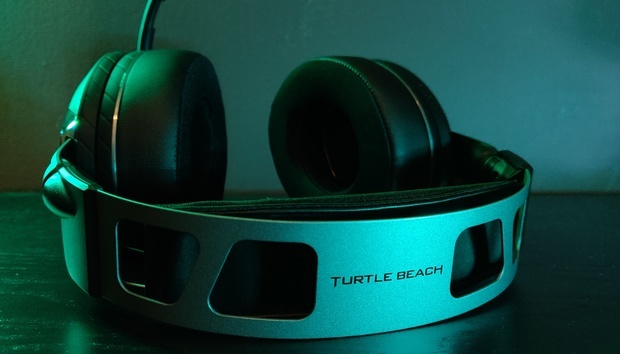 Turtle Beach’s ProSpecs tech is in there too, of course—the company’s patented “glasses relief system,” a slim channel on each earcup that lets you wear glasses without the headset pressing them into the side of your head. I don’t wear glasses myself, but it’s a nifty feature regardless. That rubber tab on the right side enables or disables ProSpecs. The microphone is a detachable boom design, meaning you could potentially wear the Elite Atlas out in public. I probably wouldn’t, but you could. The main audio cable detaches as well, with the default setup adding rudimentary in-line controls—a small volume wheel and a mic mute slider. Those who need more slack in the line can also add the included extension cable, which terminates in split 3.5mm jacks for headphones and mic. That’s the one weird aspect of the Elite Atlas: In an era where everyone’s moving to USB, especially on the PC, Turtle Beach’s flagship headset is stuck with 3.5mm connections. It’s not necessarily a drawback. Hell, one of our favorite headsets, the HyperX Cloud Alpha, is the same way. But hopefully your PC’s onboard sound is decent. There’s also no RGB lighting, though that’s undoubtedly a positive trait for some of you. And with a 3.5mm connection, it also means there’s no software component for the Elite Atlas and thus no official EQ functionality. Too bad, because it could use some tweaking. First let me say: The sound profile’s not too bad for gaming, and I guess Turtle Beach knows its target market in that regard. The Elite Atlas has a bright sound, similar to Corsair’s headsets—heavy on the treble and the upper mid-range. It helps voice chat cut through the mix, plus attention-grabbing noises like bullet cracks, breaking glass, or footsteps. If you’re buying a headset to play first-person shooters all day, the Elite Atlas might not be a bad choice. I firmly believe most people are buying a single headset for general-purpose use, though. That’s why I typically test headsets with a wide range of games, music, and films. The Elite Atlas is great for gaming, but music and films both collapse a bit under this overly bright quality—music most of all. To borrow a guitar phrase for a second, I’d say the Elite Atlas suffers from “scooped mids.” The high-end response is great, the bass is punchy, but the mid-range—aka. most sounds—are given short shrift. Pipe any complicated music track through the Elite Atlas and all the instruments sort-of blend together into mud instead of separating neatly into their component tracks like you’d want from a good headset. It doesn’t help that the Elite Atlas’s soundstage is fairly narrow, giving those instruments even less room to breathe. It’s not a terrible-sounding headset—especially for gaming, as I said. With a bit of EQ you can even fix some of the more egregious problems. But while Turtle Beach’s design sense took a huge leap with the Elite Atlas, audio fidelity still has a ways to go to compete with HyperX, Logitech, and other modern favorites. The one exception is the microphone. I wasn’t expecting much, given its detachable nature, but the Elite Atlas’s microphone is actually surprisingly good, especially for a $100 headset. Voice reproduction is decent, and even though there’s no software the Elite Atlas still does a pretty good job isolating voices from background noise. So yeah, the Turtle Beach Elite Atlas won’t be the first device I grab when I’m listening to the year’s best albums, but it’s a perfectly serviceable gaming headset you can wear all day long, no problem. I really can’t stress enough how damn comfortable the Elite Atlas is, even if I have quibbles with the sound. It’s up there with HyperX in that regard, at least. Now if only Turtle Beach could catch up in other metrics. Hopefully the Elite Atlas is a sign of things to come.